I definitely knew I was fit enough to climb this mountain without trouble, but what happened with my lungs? 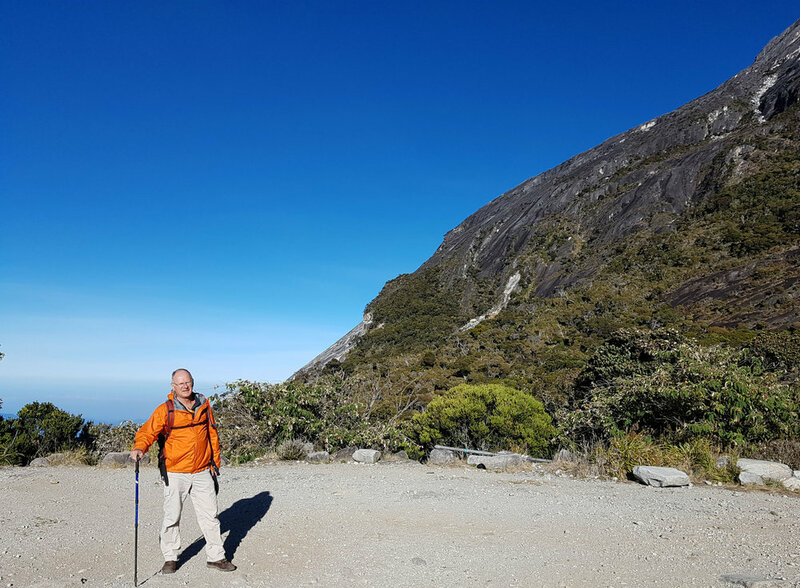 Climbing the highest mountain in Borneo, 4095 meters above sea level? The highest point on earth I have been was in Colorado, USA, driving across the 3700-meter Independence pass, in a car! 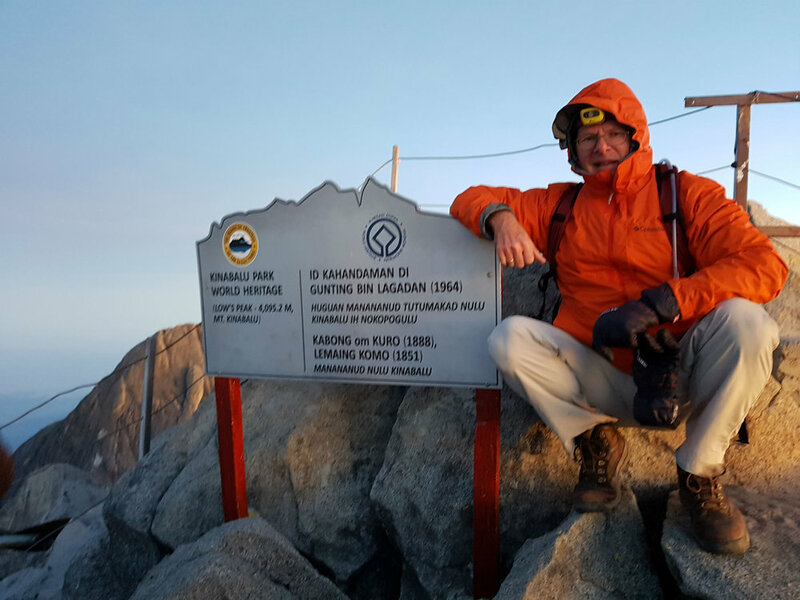 In Java, Indonesia, I hiked up the 1900-meters high Merapi volcano, my highest climb ever. But this was different. 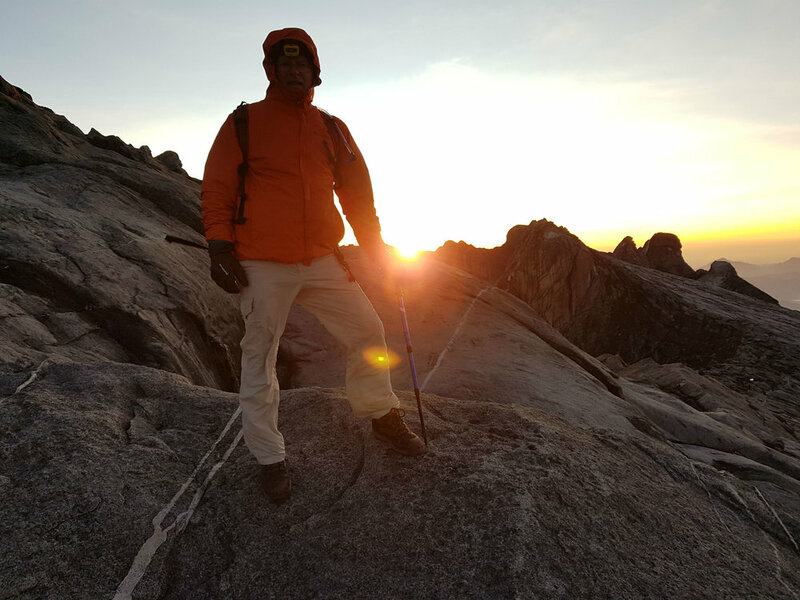 Climbing Mount Kinabalu means hiking up a steep trail, ascending 2300 meters. 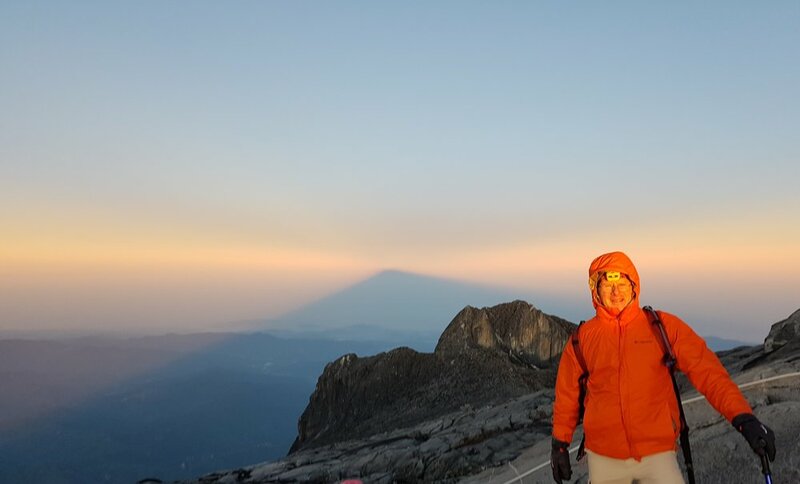 The total walking distance is only 14 km, which means the challenge is to climb many rough and uneven wooden-planked steps, rocks, big boulders and sloping flat granite rock face. Covered in lush tropical forests, the top 900 meters could not be a bigger contrast, as it is a dark jagged, steep-sloping granite outcrop. Together with my guide Reiza I started the climb at the Parks HQ at 1850 meters above sea level. I carried layers of clothing, a rain jacket, gloves and a water bag in my back pack. The weather was perfect for hiking, with clouds covering the lower parts of the mountain. The air was warm ( 25 C) and damp, but the altitude gave the tropical heat a balmy feeling. It was the dry season and because it hadn’t rained for a couple of weeks, the ground was bone-dry and hard. From the very start, as I had expected, I had to climb a seemingly endless flight of wooden stairs and boulders. 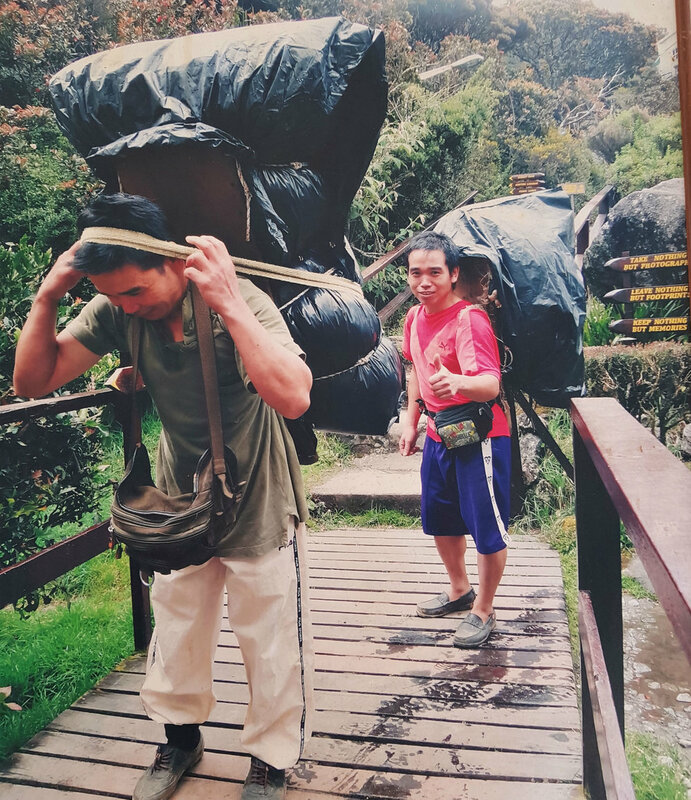 I passed porters carrying up to 50 Kg supplies to the Panalaban base-camp as there were no roads other than this path to bring supplies up there. It takes them 4 - 5 hours to ascend 1400 meters to Panalaban station. They are people from the nearby villages living a subsistence life from farming (mushrooms, tea, banana, mountain rice, vegetable) and tourism. They earn 1 US$ per kilo they haul up to the station, for some a full-time job. Mount Kinabalu Park Head Quarters at 1850 mtr. Sunset from the base camp. I was above the clouds. Resthouse at 3250 meters. Breathing became harder, not much vegetation. At 3250 meters the sky was dark blue. The top of the mountain was behind the cliff in the back. Up to 2500 meters the mountain was covered in dense equatorial jungle, providing ample shade. Then I saw the vegetation gradually changing to a more sub alpine growth, with sturdy shrubs and mosses covering the rocks. Mountain squirrels scurried across the trail. At 3000 meters abruptly the vegetation stopped and bare rock face dominated the landscape. Here is where I passed the treeline. I heard no birds anymore and a chilly breeze made me put on my wind jacket. For the first time I felt my breathing more difficult. Each uphill stretch lasted just a bit longer than I hoped. 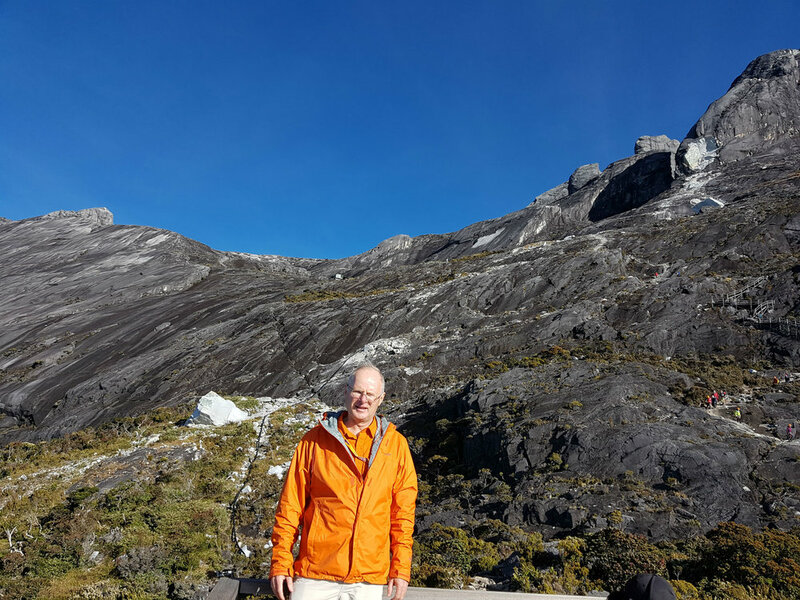 But the clouds had disappeared by now and the view of Mount Kinabalu spurred me to continue. After four hours I reached the base-camp at an elevation of 3250 meters above sea level. The temperature had dropped to around 12 C, so I put on more warm clothing. Here food and shelter were provided to the maximum 140 hikers which were allowed onto the mountain every day. Sleeping turned out to be impossible as my lungs kept pumping more air every few minutes to compensate for the low oxygen level in my blood. But my adrenaline kept me going and the next morning at 02:30 I started the final 900 meters climb. The air was frigid cold and the thin air forced me to go slow. The first 45 minutes I struggled to find my rhythm. My heart heaved. Once out of breath it was difficult to get it back, so I took the ascent slowly and steady. But as soon as I found the right pace, as in a trance I steadily climbed. My headlight and walking pole were the most important items in the darkness. One step, one breath, slowly but steady. At times I sat down on the sloping surface of the rock, looking down at the lights of the villages far below. I saw a long procession off headlamps of the other hikers making their way up. Plodding on, I kept looking at the feet of my guide. I was gasping for air. The enormous bare granite mountain top had a steep path marked by a rope which was turned through loops anchored to the rocks. The face of the top is a sheer granite slab, lined with crevices, nearly vertical, forcing me to hold on to the rope, pulling myself up the cliff. At one point I was literally on all fours. Luckily the darkness concealed the long drop down. My headlight shined on the next spot I placed my foot. Reiza paused and looked behind at me, making sure I was following. And finally after two hours, I reached the 4095 meters summit of the mountain: Low’s Peak! The top was a few square meters area to stand on, with a plaque marking this iconic point. It was 2 C, the wind blowing, totally cloud free sky. When the light broke across the horizon, I was exhausted, but did not want to admit that. Catching my breath, I looked out across the surrounding Crocker mountains and villages far down below. On the horizon I saw the port city of Kota Kinabalu and the South China Sea. The sun climbed behind me, its light hit the mountains on the horizon. As my eyes started to adjust to the daylight, I saw the early morning mist hang over the mountains below, an experience not to be missed. I drank some water and wiped my mouth with the back of my hand, sitting on the edge of a massive boulder staring at this surreal landscape. The other hikers, mostly from China, Korea, Malaysia and a few from France and Australia, all looked exhausted, breathing heavy, wrapped against the cold. I snapped the obligatory pictures and knew the only thing left to do was walking down: what a pain! It was so cold that my hands hardly could handle my smartphone. Fortunately, soon the sun warmed me up and I started the decent. Going down made me realize the heights I just climbed up and how steep some parts of the mountain were. I found it interesting to see the landscape that I had no clue about when walking uphill in complete darkness. Mind-boggling to realize this mountain was pushed up from the earth's crust as molten rock millions of years ago, still being pushed up 5 mm per annum. On the trail down from Low’s Peak, I saw light colored straight-sided bands of rock crossing the granite plateau, made of quartz. I also saw the huge white boulder which rolled down the mountain during the 6.0 magnitude earthquake in 2015, killing 18 hikers. A tragic event engrained in the memories of the guides I talked to. This mountain is all about raw nature, to be respected at all times. More hikers arriving at Low's Peak as sun started to warm me up. From the top.... You cannot see the chilly wind on this picture, but it certainly was there. Exhausted but proud to be on the summit. Stunning views across the surrounding mountains and valley's. With my guide Reiza descending from the summit. Note the white lines in the rock: quartz deposits. A surreal feeling standing on that mountain top. Resting next to the rope which led to the top. Under an unusual blue sky I walked down to the base station to spend another night, before the final descent. I was relieved not to have suffered from any altitude sickness as some other hikers had. Going down this steep trail certainly took a toll on my knees and legs, but my preparation for this adventure turned out to be sufficient, avoiding any serious injuries.